Bad news. The Adrenaline Vault (www.avault.com) is offline and looks down for good. A review on the Adrenaline Vault, as seen in 2006. On a recent message posted on the Adrenaline Vault Facebook Page, Chip Hansen announced that the Adrenaline Vault came under a systematic DDOS attack at the start of June which resulted in the complete loss of the website and its databases. First launched in 1995, the Adrenaline Vault provided gaming and hardware news and reviews for a period of 17 long years before its existence was suddenly. Part of the website is currently available on the Wayback Machine. I appreciate the archive from a basic fast to browse HTML page. The Wayback Machine is not responsive nor reliable enough for comfortable viewing. What is the date of this newspost? Avault has been up and down a few times. Hi. 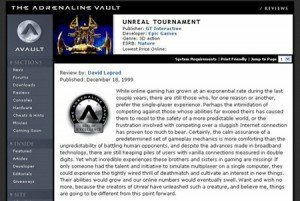 I collected the Avault reviews in 2006 and posted them in July 2013 after the site got closed down. The wayback machine is indeed very incomplete. I couldn’t salvage anything I didn’t already have from there.